Fight Now: Eat and live proactively against breast cancer is a program designed to help you make choices that can lower your risk of breast cancer. It was created by Dr. Aaron Tabor, MD, a graduate of the John Hopkins School of Medicine who has conducted a number of research projects exploring preventative nutrition. Tabor states that if women do not work proactively to prevent breast cancer then their risk of getting breast cancer, or having a recurrence, is much higher. 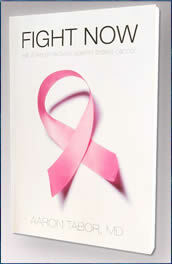 In this book he outlines simple and practical food and lifestyle choices that women can implement to lower the risk of being affected by breast cancer. Tabor explains the factors that can increase cancer risk and outlines medical research showing that diet and lifestyle can play a major role in prevention of breast cancer. He also emphasizes the importance of a simple lab test that can identify the presence of a vitamin D3 deficiency; a factor that may increase the risk of breast cancer by up to 70%. Specific foods and supplements are highlighted that can help fight and prevent breast cancer as well as other diseases. Many of these foods are high in antioxidants that help to protect DNA from free radical damage. General recommendations are to eat a diet that is high in fiber with a low glycemic index. Foods rich in omega 3 fats are also an important aspect of this plan. A basic low calorie meal plan structure is provided for dieters who need to lose weight, however the Breast Cancer Diet does not include a meal plan for dieters who wish to maintain or gain weight. Carrots, green tea, apples, cereals, beans, nuts, flaxseeds, walnuts, pomegranates, broccoli, vitamin D fortified milk, salmon, tuna, sardines, mackerel, cod, shrimp, eggs. Women who have survived breast cancer need to maintain a commitment to staying healthy and taking care of their bodies. The Whole-Food Guide for Breast Cancer Survivors presents vital information for creating a personalized plan for breast cancer prevention. Essentially this book is a manual to help keep your body healthy with a whole-foods diet and nutritional supplementation. The diet for preventing recurrence of breast cancer emphasizes antioxidant-rich, anti-inflammatory and immune-stimulating foods. It is recommended to consume six to twelve servings a day of fresh, whole fruits and vegetables. These plant foods can contain up to 100 phytonutrients, which have been associated with cancer-protection and health recovery. In conjunction with fruit and vegetables the diet includes healthy fats, complex carbohydrates and lean proteins in appropriate portions. As well as preventing cancer, a nutritious diet promotes increased energy, balanced emotions and makes it easier to manage your weight. If cancer is discovered in your body, these same dietary choices can slow the progression of the disease and increase survival time. Also highly beneficial is access to pure air and water, regular physical activity, stress management, adequate sleep and social support. In addition a healthy lifestyle can also improve tolerance of treatments such as chemotherapy and radiation. A nutrient-dense whole foods diet is critical for keeping cancer at bay. However, sometimes it is difficult to get all of the nutrients you need from food. Certain nutritional supplements are recommended for women due to scientific research suggesting their value for reducing the risk of cancer. This book provides advice on beneficial supplements and information on specific nutrients that can actually be harmful in high amounts. It also discusses nutrient deficiencies that can occur as a result of the use of prescription medicines. Physical activity is important because it helps prevent weight gain and obesity as well as stimulates your immune system to fight cancer. Walking is recommended on the breast cancer diet for thirty to forty five minutes a day, six days a week. Fight Now: Eat and live proactively against breast cancer is now free for a kindle version. 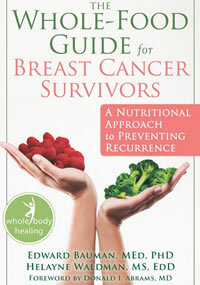 The Whole-Food Guide for Breast Cancer Survivors: A Nutritional Approach to Preventing Recurrence retails at $18.95. Reduces the risk of breast cancer as well as heart disease. Encourages the consumption of whole grains, legumes, fresh fruit and vegetables. Highlights the importance of a low glycemic index diet. Provides information to assist with weight loss. Acknowledges the importance of stress reduction for health. Dietary recommendations are not always supported with practical advice. Encourages the intake of processed foods such as protein bars and high protein chips that are not the most health-supportive choices. The meal plan provided is too low in fruit and vegetables to provide the cancer-preventative effect that has been indicated in scientific research. Readers of Fight Now are provided with lists of recommended dietary changes, however what is lacking is the practical information necessary in order to achieve these goals. For example, dieters are told to consume thirty or more grams a day of soluble fiber without being given information about exactly how to achieve this. In addition to the lack of specific guidelines the dietary recommendations given for weight loss are not in accordance with the high intakes of fruit and vegetables that have been indicated to be necessary to reduce the risk of breast cancer. The advice given will certainly result in improvements to health and a reduction in the risk of breast cancer for dieters who are currently eating a standard Western diet. However those with a high risk of breast cancer will probably require a more structured approach in order to achieve the highest degree of protection.